You may see a resemblance between these Louisiana black bear cubs and your favorite cuddly teddy bear. The real-life inspiration for everyone's favorite plush toy has just gotten a new lease on life. For more than two decades, the Louisiana black bear - the iconic beast that inspired the "teddy bear" - has been considered a threatened species. But the adorable fuzzy bear will soon be removed from the Endangered Species List, the U.S. Fish and Wildlife Service (FWS) announced on Thursday (March 10). The Louisiana black bear (Ursus americanus lutelous) first entered the national consciousness in 1902. During a bear-hunting trip to Mississippi, President Theodore "Teddy" Roosevelt refused to shoot an old bear his aides had trapped and tied to a tree, calling the whole affair "unsportsmanlike." The story spread in U.S. newspapers, leading to an editorial cartoon published by The Washington Post. A New York City candy-store owner saw the cartoon and put two stuffed bears - which he called "Teddy's" bears - in his shop window, according to the Theodore Roosevelt Association. The plush toys became so popular that the shop owner began mass producing them. Since inspiring one of the world's most beloved toys, however, the species had fallen on hard times. Louisiana black bears once roamed the seasonally flooded forests of Louisiana, southern Mississippi and eastern Texas. By 1980, however, people had destroyed or modified much of this habitat, leading the bear to be listed as threatened in 1992, when as few as 150 bears were living in the wild. To help the iconic species recover, a host of governmental and nongovernmental organizations, along with private landowners, worked to restore 750,000 acres (3,035 square kilometers) of the bald cypress, oak and gum forests where the bears live. Because a majority of the Louisiana black bear's habitat falls on private lands, Louisiana farmers were offered financial incentives to restore difficult-to-farm patches of land into native hardwood forests. 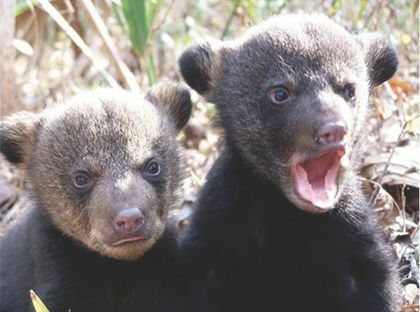 Now, between 500 and 750 Louisiana black bears roam the U.S., the FWS estimates. The FWS also released a monitoring plan to make sure the bear population can be sustained. "President Theodore Roosevelt would have really enjoyed why we are gathered here today," U.S. Secretary of the Interior Sally Jewell said during the news conference. "Working together across private and public lands with so many partners embodies the conservation ethic he stood for when he established the National Wildlife Refuge System as part of the solution to address troubling trends for the nation’s wildlife." Louisiana Gov. John Bel Edwards called the bear an "iconic symbol of our nation and Louisiana," where it is the state mammal. The bear was protected under the 1973 Endangered Species Act (ESA). More than 2,000 species worldwide are listed under the act as endangered or threatened, nearly 1,500 of which are native to the U.S.